I love coincidences. One of the best is that moment when you hear about something and then start to see examples of it all around you. Another theory is that it was there all along and you just needed your eyes opened to it. I had that happen to me recently. 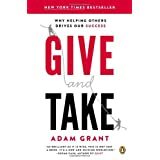 A good colleague recommended the book, Give and Take, by Adam Grant (see reviews and link to Amazon below). The book makes a strong, research based case for why it is beneficial to do what we all should be doing anyway: giving. His focus is more on your professional life, but I think the principle applies to both our business and personal lives. 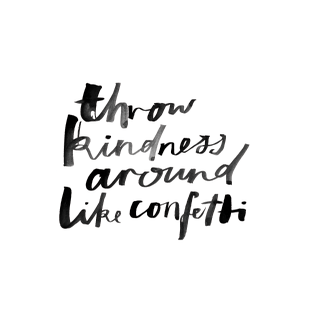 That very day I saw this great print that said, "Throw Kindness around like Confetti" (available at: http://biancacash.bigcartel.com/product/throw-kindness-around-like-confetti). I love the notion of kindness among us being as ample as confetti on New Year's Eve in Times Square. That we wherever we looked we would see and feel kindness. Imagine that! It is something we all can do right away and benefit from profoundly in a professional and personal way. Click here to see this book on Amazon. An academic, Grant explains that added to hard work, talent, and luck, highly successful people need the ability to connect with others. We learn givers give more than they get, takers get more than they give, and matchers aim to give and get equally; all can succeed. The author’s aim is to explain why we underestimate the success of givers, to explore what separates giver champs from chumps, and what is unique about giver success. Emphasis on teams and the rise of the service sector offers givers access to opportunities that takers and matchers often miss. In the first section, the author explains his principles of giver success, and, in the second part, with insightful stories he explores the costs of giving and how givers can protect themselves against burnout and becoming pushovers; helping others does not compromise success. Grant concludes with his hope that this book will provide his young daughters’ generation with a new perspective on success. A worthy goal for this excellent book. --Mary Whaley --This text refers to the Hardcover edition. Backed up by anecdotes of success across a range of industries and scenarios, as well as numerous academic studies, the arguments of Give and Take are grounded in ample research...His writing style draws you in...it's an interesting take on game theory in a practical context, and the notion that givers can succeed is an inspirational one. CITY AM --This text refers to the Hardcover edition. Follow Sassafras Paper's board beautiful words on Pinterest.